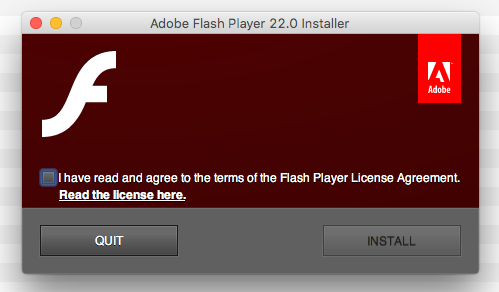 I’ve routinely found the standard Adobe Flash player updater for Mac (OS X/macOS) fails right at the end, without explanation. This is a very fast and handy way of seeing if your copy of Flash or Silverlight is up to date. Paul Moore tweeted this demonstration of a rather devious phishing scam earlier, where someone has taken advantage of the fact a capital I can look virtually identical to a lower-case L in sans-serif fonts* (and therefore a hacker can register a domain with the incorrect spelling and provide a link that tricks people.). Letters can also be paired: an adjacent r and n make a convincing m if you’re not looking closely. There is some protection in browsers against this nowadays: as soon as you press return (though not as you type or paste the URL in) the entire address is converted to lower case. In Firefox, the domain is highlighted in black while the rest – including, crucially, any subdomains that precede it – is greyed out, providing a further hint to the site’s real identity. This will make the font bigger and use the default serif font rather than a sans-serif one. I and L are easy to distinguish and, for web developers, having a larger typeface probably helps, regardless of how good your eyesight is – we look at URLs more often than most people, after all. It ought to reduce the number of typos you make. There are Add-ons that do similar things if you don’t want to write your own CSS. GDS, the Government Digital Service, use a specially designed sans-serif font called New Transport based on Kinneir and Calvert’s work on British road signs. Note the legibility clues, especially the curve at the bottom of the lower-case L.
Over time we’ve recognised text inputs are better when they’re bigger and made it easier for users to change the zoom level, but the address bar has remained resolutely small and in a font that’s not as legible as it might be. Perhaps we should fix that.